As a a reigning queen, Margrethe II of Denmark has access to a wide array of jewels, ranging from pieces that are a part of the nation's crown jewel collections to items of personal jewelry. Today, we're going to have a look at a little mini collection that belongs to the queen: her turquoise jewelry. Margrethe has two sets of turquoise and diamond jewelry: an older suite and a more modern one. The older jewels were apparently inherited by Margrethe from her mother. The set includes a pair of diamond earrings with turquoise pendant stones, a large brooch (really, almost a small stomacher) that features three large turquoises set in diamonds, a smaller brooch, and a small bandeau tiara. The queen has also worn parts of the large brooch as a pendant on a diamond necklace (seen above at one of the events celebrating the wedding of Crown Princess Victoria in 2010). I've seen some speculation that the turquoise bandeau may have been a gift to Crown Princess Margareta from her parents, the Duke and Duchess of Connaught. I've also seen it speculated that the turquoises in this older set may be Russian in origin and could even have been owned by members of the imperial family. (I'm not sure that either of these pieces of information is completely accurate, so I'd appreciate confirmation or refutation if you can offer it!) I've also never seen a reliable reference to the tiara's maker, though I personally think it bears a significant resemblance to the daisy bandeau worn by Crown Princess Mette-Marit of Norway. Regardless, we do know that the tiara was worn in a portrait by Margrethe's mother, Ingrid, when she was a Swedish princess. That portrait has been a source of some confusion; although Ingrid wears a veil, she is wearing Swedish court dress, not her wedding gown. She did not wear a tiara at her wedding. We also know that Margrethe began wearing the piece way back in the 1960s (including an important outing during the pre-wedding celebrations for her sister, Queen Anne-Marie of Greece), though she has only started to wear it regularly for events like state banquets within the past decade. The tiara has also been lent to others on various occasions. 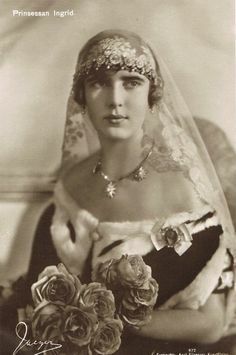 It was worn by Crown Princess Martha of Norway (mother of the current king) at the wedding of her sister, Astrid, to King Leopold III of Belgium in 1926. On that occasion, it must have been Martha's cousin, Ingrid, doing the lending. 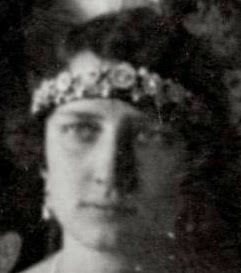 In later years, the tiara has been worn by Madeleine Tengbom (maternal grandmother of Prince Richard of Sayn-Wittgenstein-Berleburg, the husband of Princess Benedikte of Denmark) at her grandson's wedding , and by Princess Theodora of Greece and Denmark at her aunt Margrethe's Ruby Jubilee in 2012. Margrethe also has the turquoise and diamond Devonshire Brooch in her personal collection. This piece, which features a large turquoise surrounded by four diamonds, was a wedding gift in 1905 to Crown Princess Margareta from the Duchess of Devonshire. One of the newer turquoise pieces in the queen's collection is the large turquoise brooch made for her in 2000 by Torben Hardenberg. The brooch has a mythological motif in its design, which includes an image of Diana, goddess of the hunt, and a deer. The piece is made of three large turquoises (said to have come from the Danish royal family's collection), gold, silver, and diamonds. Margrethe wears this brooch with a coordinating pair of modern turquoise and diamond earrings that have detachable pendant sections. 1. Photos of Crown Princess Martha and Madeleine Tengbom wearing the tiara can be found here.